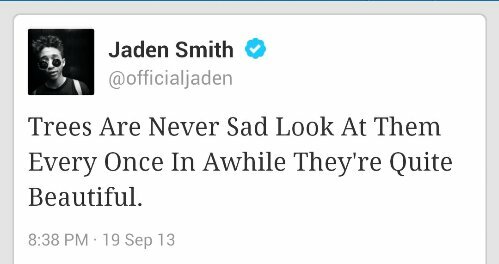 Jaden Smith has derailed. 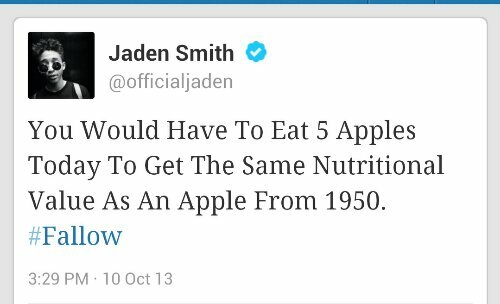 I know it must be tough when your father is Will Smith and you have all this pressure to succeed but Yoko Ono is starting to make more sense than Jaden Smith. Apples, the number 3, trees and eye mirrors. Those sound like entries from Creed Bratton’s manifesto, not the tweets of a sane 15 year old. Pretty soon he’ll be smashing toy trucks during a sales meeting for Callahan brakes. Posted on October 15, 2013, in Average Blog Posts and tagged smith, Twitter. Bookmark the permalink. Leave a comment.